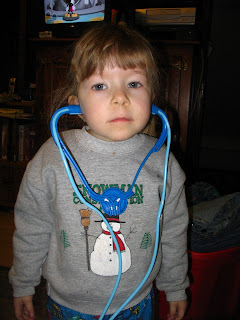 Addie was playing doctor yesterday morning. She checked my heart, it goes "thump thump thump." She checked the blood pressure on each wrist (8 on the Left, 15 on the right). Then with her little yellow otoscope, she checked my ears. She gravely announced that I had bugs and dinosaurs in my ear. I asked if that was normal. "Oh yes, it just fine." Well good, at least I know I always have bugs and dinosaurs in my ears. I wonder if I should name them like pets. The future Dr. Poskozim...just think she could support you in your old age!